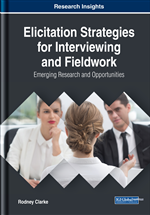 From an SFL perspective, the many completed acts of communication or texts associated with interviewing—the unfolding interview itself, the audiovisual record of the interview, interview protocol, the ethics, legal, and collateral texts—can only be understood within the contexts of their production and reception. SFL employs several contexts and one of these is referred to as the context of culture or genre. Genres are patterns associated with completed acts of communication that reveal conventionalized stages. These staged patterns of communication are learned and taught in institutions. Consequently, a genre literacy is likely to be shared between both interviewers and interviewees: a kind of common cultural capital. A range of textual strategies enable genres to be elicited or restarted. Alternatively, a wandering interviewee can be brought back to the point if necessary. This chapter provides an argument for using genres as a firm foundation for interviewing practices. One of the many deficiencies of Shannon’s (1948) model, as a model of human communication, is that it is acontextual. For the purposes of understanding interviews and interviewing, this chapter starts by looking at context. Parallels exist between the synthetic systems thinking approach proposed by systems thinker and organizational and societal researcher, Russell Ackoff (e.g., see the work of Ackoff & Emery, 1972), and SFLs conception of the relationship between text and context. While some relevant similarities between these two theories - of systems and language - are explored, the advantage of SFL is that it utilizes a more nuanced conception of context proposed by the pioneering social anthropologist, Bronisław Malinowski (1923). A completed act of communication must be understood from the perspective of two contexts, one which describes the immediate circumstances or Context of Situation in which the text occurs, and the other associated with the Context of Culture that provides features that make texts more intelligible to listeners or readers, as well as facilitating their production by speakers or writers. An overview is provided of the general architecture of SFL. Specifically considered is SFLs unique approach for understanding the contexts of language, a description of some of its language resources and their modularization into strata, as well as the cross-classification of language according to the main functions that all “natural” language is designed to serve, namely, its metafunctions. The modularization of SFL resources into strata (Martin, 1992) provides a way for those interested in applied functional theory to select those resources they need in order to undertake specific studies. As will be argued in the remainder of the book, it is the context strata that are most relevant to considering the research interview, and interviewing, from the perspective of practices. The methods that are used to describe the situational context and cultural context of a text are explained in detail. The key SFL resource that is used as the basis for the remainder of the book is the cultural context of a text also known as its genre. There are many different theorizations of genre but the one that is relevant to this study is the concept of genre as a global rhetorical organization for texts. The role that genre plays in society, its role in providing conventions that assist in determining the meanings of texts and particular social occasions, as well as the role of genres in education and research, are described from an SFL perspective. Genres can be analyzed formally using a range of language resources - the bespoke genres. But there are many genres that are in fact standardized or canonical in form because what is expected of them is valued and privileged within cultures, societies and organizations. Genres that enable personal experiences to be recounted, the packaging up of experiences into descriptions, or that enable thoughts to be organized into explanations or stories, are highly valued so-called canonical genres. The specific canonical genre families that are used here as the basis for our interviewing practices will be selected and introduced in this chapter but described in detail in the next.